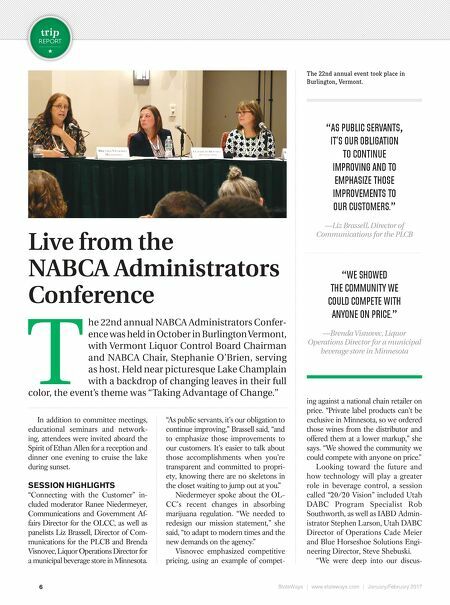 StateWays | www.stateways.com | January/February 2017 6 REPORT tr i p T he 22nd annual NABCA Administrators Confer- ence was held in October in Burlington Vermont, with Vermont Liquor Control Board Chairman and NABCA Chair, Stephanie O'Brien, serving as host. Held near picturesque Lake Champlain with a backdrop of changing leaves in their full color, the event's theme was "Taking Advantage of Change." Live from the NABCA Administrators Conference In addition to committee meetings, educational seminars and network- ing, attendees were invited aboard the Spirit of Ethan Allen for a reception and dinner one evening to cruise the lake during sunset. SESSION HIGHLIGHTS "Connecting with the Customer" in- cluded moderator Ranee Niedermeyer, Communications and Government Af- fairs Director for the OLCC, as well as panelists Liz Brassell, Director of Com- munications for the PLCB and Brenda Visnovec, Liquor Operations Director for a municipal beverage store in Minnesota. "As public servants, it's our obligation to continue improving," Brassell said, "and to emphasize those improvements to our customers. It's easier to talk about those accomplishments when you're transparent and committed to propri- ety, knowing there are no skeletons in the closet waiting to jump out at you." 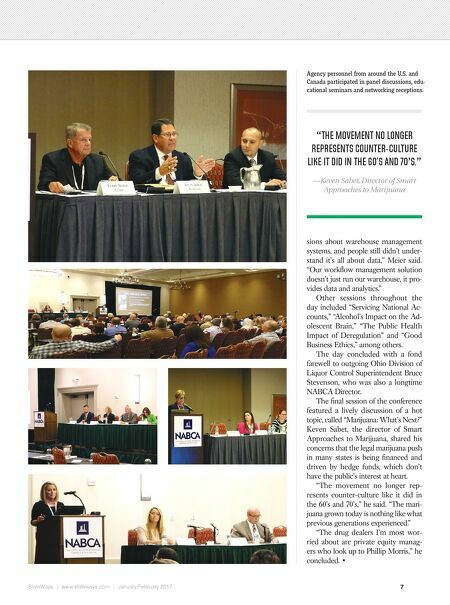 Niedermeyer spoke about the OL- CC's recent changes in absorbing marijuana regulation. "We needed to redesign our mission statement," she said, "to adapt to modern times and the new demands on the agency." Visnovec emphasized competitive pricing, using an example of compet- ing against a national chain retailer on price. "Private label products can't be exclusive in Minnesota, so we ordered those wines from the distributor and offered them at a lower markup," she says. "We showed the community we could compete with anyone on price." Looking toward the future and how technology will play a greater role in beverage control, a session called "20/20 Vision" included Utah DABC Program Specialist Rob Southworth, as well as IABD Admin- istrator Stephen Larson, Utah DABC Director of Operations Cade Meier and Blue Horseshoe Solutions Engi- neering Director, Steve Shebuski. "We were deep into our discus- "AS PUBLIC SERVANTS, IT'S OUR OBLIGATION TO CONTINUE IMPROVING AND TO EMPHASIZE THOSE IMPROVEMENTS TO OUR CUSTOMERS." —Liz Brassell, Director of Communications for the PLCB "WE SHOWED THE COMMUNITY WE COULD COMPETE WITH ANYONE ON PRICE." —Brenda Visnovec, Liquor Operations Director for a municipal beverage store in Minnesota The 22nd annual event took place in Burlington, Vermont.